All Things Food / Bacon for valentines day? Give your special someone a present he or she will love—BACON! On Saturday and Sunday, Feb. 12 and 13, starting at 5 p.m., Moon River Brewing will offer a baconed up entree for $16. On Feb. 14, we will offer a three-course, bacon-centric dinner for $28 per person. Bacon martinis and Bacon Bloody Marys will be available for $9 each. So what temperature do you prefer to keep you keezer/kegerator set at? Can you give your reasons for selecting your preferred temperature? The Pub / BCS kickoff time! Predictions? Hopes? Beers? Beer for tonight: American Brown Ale...my "Slobber Brown." I'm in Georgia, so yes I'm pulling for the SEC. This seems to make most sense as an all-grain post. First impulse, what might you expect from these two circumstances? What about flavor profile? Final gravity? The Pub / How low can you go? So to what low will you sink in regards to beer drinking? Are there some beers you just won't drink? As admitted on another post, I'll drink Bud Light. Heck, I've even drank Bud Light Lime on a golf course. But I won't drink malt liquor. No way. No Olde English 800, No Schlitz, no Clot 45. Iron City? Schaffer's? Natty Light? PBR? Hamms? Natural Light? Come on...confession is good for the soul. Fess up. Wood/Casks / Cask ale conditioning/carbonating. Looking for advice from those with first-hand experience with conditioning/carbonating in a cask (SS firkin or pin; I have a pin). I bought a stainless steel pin from UK Brewing supplies back in February 2006. To "test it out," I brewed a simple Mild Ale from extract, racked it into the pin, primed it, and drive in a wooden shive. Now here's where I think I made my first mistake; I left it to carbonate at room temperature. About ten hours after sealing it up, CO2 was escaping from around the shive...not sure if this should happen or not...but I suspect it is normal, as the CO2 held by a cask ale is a function of the solubility of CO2 at "cellar" temperature. (yes?) Five days later, after cooling it for a day, I tapped it. The ale was tasty, but was too flat...not as in the American response of "this English beer is flat," but "just about devoid of carbonation" flat. I did some research and decided my error was in not conditioning it in low 50s temperature. At the time I had no space to do this properly, and was at a lack for getting together enough people to drink up five gallons before it staled, so the cask was used to age 5 gallons of lambic...for two and a half years. So...fast forward to now: emptied the cask of lambic, cleaned it VERY well, filled it with a low gravity American brown ale, dry hopped it with Liberty, primed it and placed it in a temperature controlled fridge @ 50 F. Tapped it 6 days later; good taste, but I still think it failed to carbonate. Maybe too cold on the conditioning temp? Anyway, if a few kind folks with cask conditioning experience would share their knowledge, I would be humbly grateful. What can you tell me regarding percentages to use in a recipe? What was your impression of the aroma/flavor aspects of this malt? How does it interact with flavor/aroma hops? In particular, I'm looking at using it as the only other malt in an ale recipe. All Grain Brewing / Very rapid "conversion"
So...after 17 years as a "fly sparger," I decided to try my hand at "the batch side." The decision arrived at partly from things I've read here (thanks a lot, Denny) and from observing another local brewer's success at using no-sparge brewing...he's done well at competitions and his beer is very tasty. I was shooting for 15 gallons of pre-boil volume that would boil down to 13.5 gallons of 1.055...30 pounds of grain was called for. I mashed in a 150 quart cooler (sorry, not blue) that has just under 15 linear feet of 3/4" slotted copper manifold... the mash bed was 4 inches thick. The mash temp was 152F, held for 60 minutes. Thickness was around 2 qts/lb. 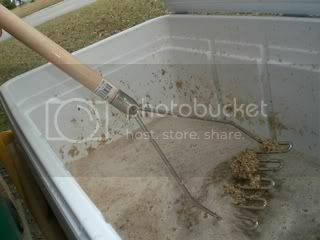 I added enough water at mash out to ensure 15 gallons run-off into the kettle. Here's where I was blown away: the run-off lasted just under 15 minutes...that's just over 1 gallon per minute. WOW...for speed, that beats any fly-sparge I've done...even one at 5 gallons. And the run-off was very clear. Next, at the end of my boil, I measured my gravity and was slightly over my target (1.056), and came in at 71% efficiency...not bad for a no-sparge beer I guess, and close to my expected target. And the stuff left in the mash tun? Well, I might as well go parti-gyle. I added 1 pound of 60L crystal and 4 ounces of caramel wheat, then added 8 gallons of 155 F water, and ran that off into another kettle, boiled it down for a while, then ran it into the first kettle...where there was 3-4 ounces of late addition hops from the brown ale that became the bittering hops for the "small" beer. I got 5 gallons of 1.030. So far, I'm very happy with the results...and am very likely converted to no-sparge/batch sparge brewing...or am I parti-gyle brewing? Seems very practical so far...and easy...and pragmatic.